The gap of college football from the end of bowl games to the upcoming 2015 NFL Draft, consists of college prospects training day-and-night in hopes of being drafted by an NFL team. Among the top college prospects in the country, is our very own dual-threat QB Marcus Mariota, who has been receiving tons of media attention lately regarding the possibility of him pairing up with former Duck coach, Chip Kelly, in Philadelphia. However, not so high prospects such as former Oregon WR Keanon Lowe, find it difficult to establish their presence on the drafting map as a possible great player in the future of a NFL team. FishDuck.com sports writer/reporter, Caleb Couturie, had the opportunity to discuss with Lowe regarding how he felt about Mariota’s performance at Oregon’s pro day, how he felt he did, and whether any NFL teams are interested in his services. 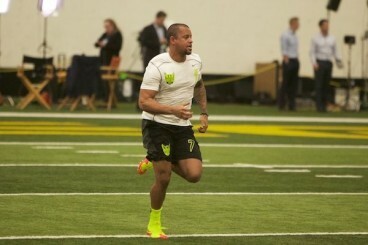 Lowe running his 40-yard dash at Oregon’s pro day. As always, Mariota was the center of attention going in and out of Oregon’s pro day on Thursday. Many experts felt that he didn’t perform to the best of his capability compared to his performance at the 2015 NFL Scouting Combine. Lowe begged to differ and explained how Mariota was “on point today. He had us walkthrough all the plays the last couple of day and really took control of the situation today.” We know from interviews conducted on Thursday that Mariota voiced how his appearance wasn’t at the best of his capability due to personal reasons. However, Lowe’s insight on the days leading up to the Oregon’s pro day, demonstrates how determined Mariota is to be the best college prospect heading into this draft. Lowe talked he’s “been working hard these last couple of months to showcase my skills to the teams.” Evidently, it was pivotal on Thursday that Lowe displayed his best football skills to the NFL teams, as he’s not regarded as a top college prospect. However, he included the fact that “there’s a couple teams that have been eyeing” him for a while. Which NFL teams exactly? This is a complete possibility, but teams such as the Oakland Raiders and Houston Texans don’t have a legitimate receiving core. Lowe could step in and prove his worthiness to not only play for a NFL team, but start on one too. This, of course, is just a hypothetical situation that most likely won’t be the case come draft day. Almost every college football fan or expert knows for certain that Mariota will be among the top picks in the draft. For players such as Lowe we can only hope he can continue his football career in the NFL.